Gourmet Pigs: The Nasi Bungkus Roundup: 5 Banana-leaf Wraps, 60 miles. Great roundup. Glad I was able to join you in one of them. None of the West Covina Indonesian restaurants serve nasi bungkus? What about the one in La Verne? Although, I think this is #4 of factual errors and/or uninformed statements I've caught? OH MAN! A nasi bungkus roundup! Awesome! Excellent. Had no idea about the others, but I'm furiously finicky about travelling outside of OC unless I have a good reason. This might just be it. And what a coincidence. I just had nasi bungkus a week ago at Toko Rame too. I wonder if you were there at the same time I was? People's Court was on the TV and it was some chick who was yapping about how her mortgage was upside down...really an unpleasant dining soundtrack. Good thing the nasi bungkus was perfect. 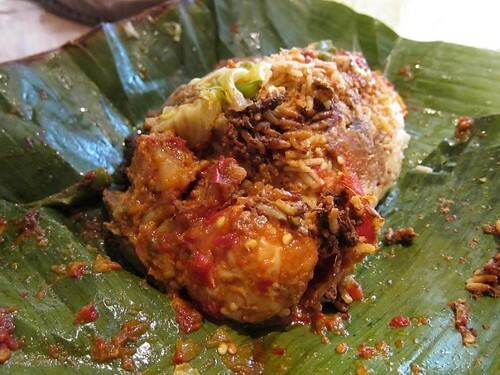 BTW, I've also seen nasi bungkus at Pondok Kaki Lima. I was at Toko Rame on Saturday but pretty early, I don't think you were there, there was just a couple eating. I'd love to meet you tho. And you're right, I should definitely include PKL in here. I should go there and revise this list. Great round-up. Nasi bungkus is one of my favorite Indonesian dishes but I'm ashamed to say I've only tried it at Simpang Asia and Java Spice. Maybe they were having an off day or maybe I'm just partial to Simpang Asia, but the version at Simpang Asia was way better. Java's was too bland and the meat had an 'off' taste when I had it. I've been consistently pleased with Simpang Asia's, especially the gizards. They're like little treasures buried in the rice. Yum. Now I'm craving it and thinking about going for lunch tomorrow. So great! Kudos to your dedication! 1. Does Nasi Bungkus ever come with Pork? I noticed that all 5 places you tried here in L.A. had Beef and Chicken only. So as for #1: Indonesia is now a Muslim country so traditional dishes like nasi bungkus - with the exception of ones from certain regions - would not come w pork. They'll be "halal" in other words. This is kinda epic. Glad you made it down to the (562)! Cuz that SEEMS to have been the best, yes? thanks! And thanks for going to Java Spice w me. and yes, I think Toko Rame's is the best after all, tho Java Spice's was pretty darn good too. Too bad they're both far. Toko Rame's nasi bungkus looks lovely with all the spicy sauces absorbed by the rice. As for the question on whether there is nasi bungkus with pork, you can find nasi bungkus babi guling in Bali, which is overwhelmingly Hindu.